Sanibel Island Real Estate, Captiva Island Real Estate - Sanibel Island - Our Bike Path! Sanibel Island - Our Bike Path! Miles and Miles of Fun! 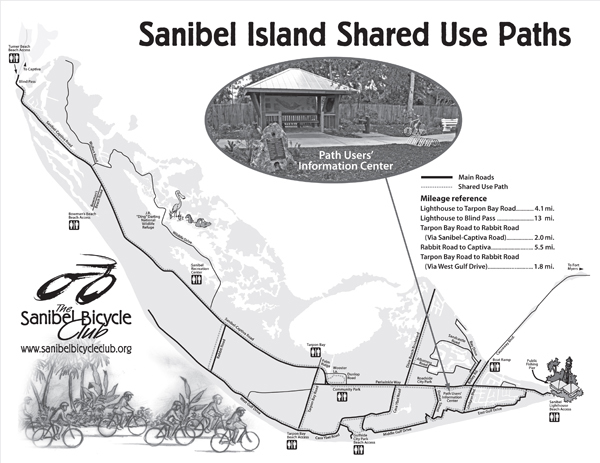 You can add over 20 miles of mixed use biking/walking trails to the list of things Sanibel Island has to offer. No matter where you are staying on the island, it's a pretty good bet that one of our bike paths passes nearby. You can take a bike ride to the Sanibel Lighthouse, or maybe to one of the many public beach access locations. Most restaurants and shops also have areas to safely leave your bike. For an interactive map you can Click Here and check out more information about our bike path routes. 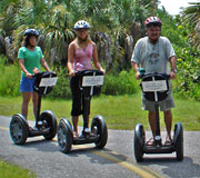 Not only can you walk or bike on the paths, you can sign up for a Segway lesson and tour! Through Billy's Bikes on Periwinkle Way, you can learn how to ride a Segway and tour the island, or rent one of their many different bike choices. Billys is just one of many places that offer bikes for rent. We also have a Sanibel Island Bike Club for all levels of bikers. They plan different rides and events around the island as well as teaching safe biking and the rules of the road. The map at the top of this blog is from the Bike Club and you can find it online as a downloadable PDF Here or by just clicking on the map. From Periwinkle Way all the way to Blind Pass Beach on Captiva Island, this is one of the best ways to get to know our island paradise! With 60% of Sanibel being wildlife preserve, you can bike or walk on secluded paths while bird watching or just enjoying our abundance of wildlife. The world famous J.N. Ding Darling Wildlife Preserve is a great place to spend the day as you explore miles of trails through our island wetlands. This summer Wildlife Drive in the Ding Darling Preserve will be closed for repaving and bridge repair, so contact me and I can give you the closure dates and an update on how long it will take to re-open. Come and enjoy everything our islands have to offer! From our historic sites to miles and miles of great shelling on our beaches, there are many reasons to consider Sanibel Island real estate! Our "season" is winding down and this is a great time to visit Sanibel and Captiva Islands! The crowds are thinning out and we have some terrific properties on the market. Whether you are interested in a home, condo or homesite, I want to help you find the perfect property! Give me a call at 239-691-4915 or use my Contact Form and we can start the search for your home in paradise! As a long-time island resident, I know every area of the island and I'm sure we can get your dreams fulfilled!